Ruth Ellen Gruber, who edits the web site Jewish Heritage Europe (JHE) and the Rothschild Foundation, which is the web site sponsor, have announced the launch of a monthly newsletter. The first edition was released this week and contains a description of the web site's features as well as highlights from the site's regular almost-daily news feed. JHE is an expanding web portal to news, information and resources concerning Jewish monuments and heritage sites all over Europe. A project of the Rothschild Foundation (Hanadiv) Europe, JHE fosters communication and information exchange regarding projects, initiatives and other developments: restoration, funding, projects, best-practices, advisory services and more. The newsfeed is updated almost daily, and by now, with well over 500 posts, it represents a major searchable database of information on the contemporary status of Jewish built heritage in Europe. JHE solicits information, news links and scholarly and opinion pieces related to Jewish heritage sites and issues in Europe. Comments, information and other submissions can be made via the website. Take a look at the website and follow it (on Facebook, too) -- and/or subscribe and share the Newsletter, too. Kehila Kedosha Janina of New York, located at 280 Broome Street, is the only Romaniote synagogue in the New World. In recent years the historic synagogue, built in 1927 and designated a landmark by the City of New York in 2004, has been entirely restored - while fully maintaining every aspect of its historic appearance (the art, architecture and community of KKJ were documented by the late Vincent Giordano in a project sponsored by ISJM in partnership with KKJ). A small exhibition space has been created in the basement where some of Mr. giordano's photos are on view, and a museum of Greek-Jewish heritage installed in the women's gallery. The Museum, energetically curated by Haddad Ikonomopoulos, actively collects family histories - through physical objects and documents and filmed oral histories. KKJ maintains weekly religious services, with Shabbat morning services followed by a traditional Greek Jewish kiddish. Synagogue and museum regularly schedule public events - lectures, concerts, etc. Marcia publishes an e-newsletter which now reaches some 6,000 recipients. The newest issue, the 65th, covers news of the KKJ community, and commemorates the 70th anniversary of the deportation of the Jewish Communities of Rhodes and Kos (July 26, 1944) and also wider news concerning Greek Jewry. Back issues of the newsletters can be found on the KKJ website www.kkjsm.org. To subscribe, contact KKJ at kehila_kedosha_janina@netzero.net. KKJ's congregation is small, so contributions to maintain Kehila Kedosha Janina's building and museum are always welcome. Checks (in US dollars) can be sent to KKJ at 280 Broome Street, New York, NY 10002 (attention Marcia). Donations enable the community to continue to hold services and preserve Romaniote traditions and customs. When in New York, be sure to schedule a visit to KKJ on Broome Street on the Lower East Side. The synagogue is open for services every Saturday and all major Jewish holidays and the Museum is open every Sunday from 11-4 and, by appointment during the week. Special Judeo-Greek themed events can be arranged for groups. 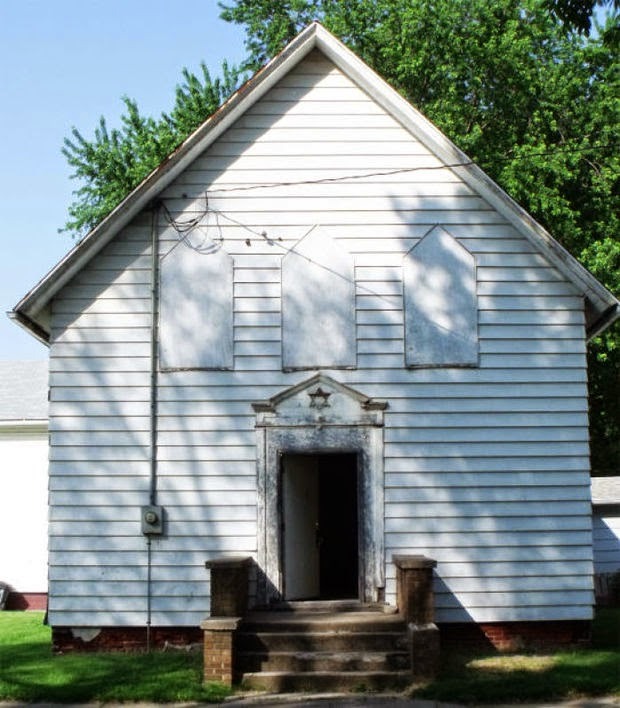 The Muscatine Journal of Muscatine, Iowa reports that the former B'nai Moses synagogue, reputedly built in the late 19th century is up for sale, after being owned for more than two decades by a local theater group. The building retains a Star of David over its entrance, and an impressive original Ark built by Charles Smith into the east wall (see Fleishaker's description below). It is not clear what will happen to the building. Though different in most details, the Ark does bring to mind that other famous and famously ornate Iowa ark built by Abraham Shulkin for the Adath Yeshurun Synagogue in Sioux City, Iowa in 1899 now in the Jewish Museum, New York. 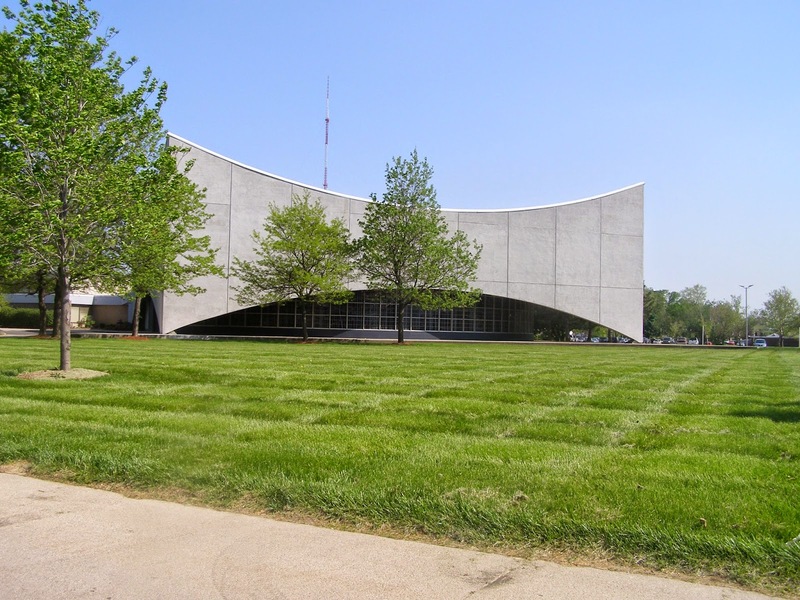 I had not previously known of this synagogue, and it is not listed by Mark Gordon on his list of extant purpose-built American synagogue buildings published in 1986 and updated in 1996. [Mark W. Gordon, Rediscovering Jewish Infrastructure: Update on United States Nineteenth Century Synagogues, American Jewish History 84.1 (1996) 11-27], but the congregation is reported by Osacar Fleishaker to have been founded in the 1890 and the synagogue built in 1893. 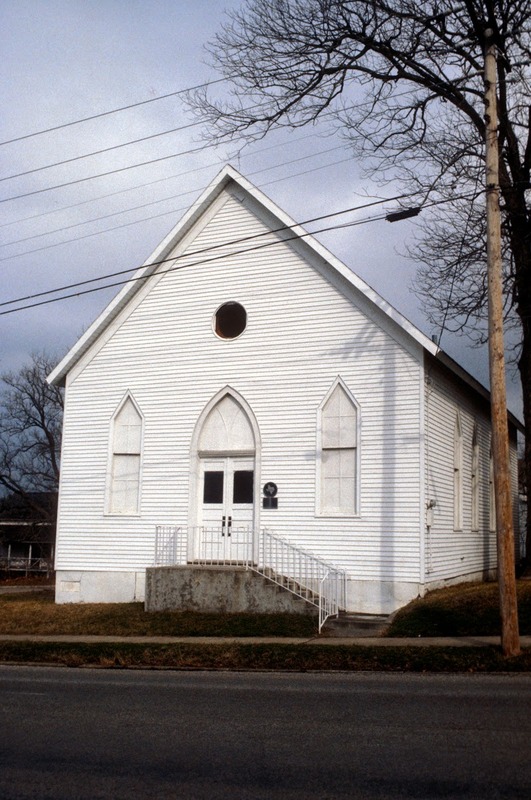 In March 10, 1890 t the first Congregation and what was to be the only one in Muscatine history was founded. It was called B'nai Moses. The Articles of Incorporation were signed by Mr. M. Rubenstein, B. Shames, Jacob Wolff and B. Goldstein. The other charter members were Isaac Helman, Hyman Share, Louis Siegel, Joe Siegel, Simon Lieflander, E. Powelanky and Charles Smith. The Congregation was very poor and money had to be borrowed for a charter. The Articles of Incorporation are quite interesting (see page 146). The name used is "Congregation of Israel of Moses Meier." The "Bible" is the Torah Scroll. Jake and Charles Smith were designated to build the Synagogue which they probably started in 1891. Meanwhile Joseph Bleeden had arrived in New York from Europe. After a few months there, he came to Muscatine to join his landsleite , his townsmen from Europe, and he became the Rabbi of Muscatine's Jewish Community. Religious services and classes were held in his home at 715 East 7th Street near where the Synagogue was being built. 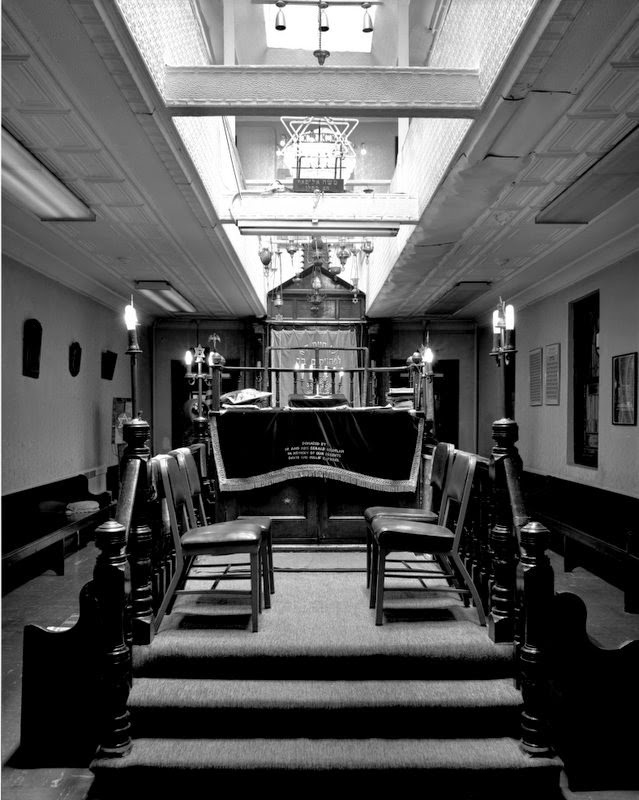 The new frame Synagogue was opened for worship, classes, and social events in 1893. (See page 147.) An insurance policy dated March 26, 1894, to cover the cost of the building in case of fire had a face value of $1,500 and was made out to A. C. Smith and N. Click. The Congregation had thirty members, and was very traditional, following all its European customs. Rabbi Bleeden served his landsleite until his death, April 11, 1916, at the age of fifty- eight. His children contributed the interesting picture which shows the 1910 group of Talmud Torah children outside of Rabbi Bleeden's home. Charles Smith soon built a new ark for the Synagogue in 1905 and rather immodestly inscribed his name, which in Hebrew was Bezalel, over the ark with four Hebrew words which mean "And Bezalel made the Ark." These four Hebrew words along with the Hebrew date 5,666 (1905-1906) are inscribed over the B'nai Moses Ark. The small wood frame building is similar to many others built by Lithuanian-Jewish immigrants soon after the first wave of Eastern-European emigration and the establishment of Lithuanian-American shtetlach in town across the country. This history which has been mostly neglected by historians of the American Jewish experience, offers an fascinating alternative narrative to the dominant one - of Jewish immigrants in the majors cities, and especially in new Jewish "ghettos" such as New York's Lower East Side and Philadelphia's South and Bainbridge Streets. The Little Jerusalem of Burlington, Vermont, the subject of a recent documentary film and an effort to save at 1910 synagogue mural is one example of these Lithuanian-Jewish settlements, as is Brenham, Texas, where some of my own ancestors lived, and where they founded the B'nai Abraham synagogue. 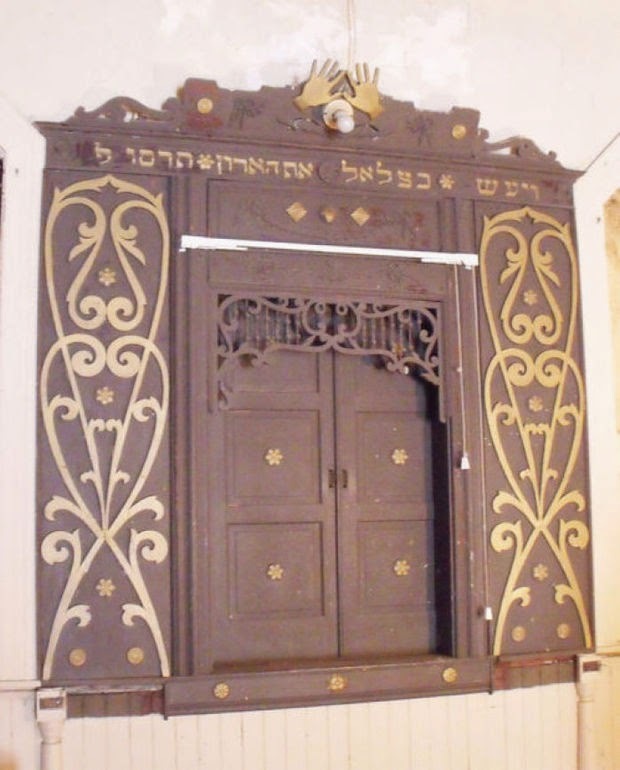 The Ohavi Zedek Synagogue in Burlington built in 1884 was brick, and is still used by the Ahavath Gerim minyan, but Congregation Chai Adam, which split off in 1889 and closed in the 1930s, built a wood frame synagogue (decorated with a mural in 1910). The B'nai Abraham Synagogue in Brenham, Texas, built like Muscataine in 1893, still retains its Jewish identity, but will be entirely moved to Austin,Texas, later this year, where it will again be used regularly for Jewish worship. Scores of similar brick or wood synagogues were once in towns across the country, but even today a good many of these remain. Yesterday was the birthday of Sidney Eisenshtat, one of America’s leading synagogue architects, who died in March 2005. He would have been 100 years old this year. Over the years I've had the chance to visit many of Eisenshtat's synagogues and I include photos here, but they hardly do the works justice. Since these places are defined by expressive and dynamic forms, and by ever-changing light, one needs to visit them to fully appreciate their strengths. Here is a link to the obituary I for The Forward wrote at the time. Eisenshtat was one of the few practicing Jewish architects who was also an observant Jew. He brought his knowledge and feeling of Judaism and Jewish practice to his religious architecture - but never let it get in the way of his fervent expressive modernism. A prolific architect in Southern California, he maintained an architectural practice in Los Angeles for much of the 20th century, but he may be best remembered for his synagogues, especially Temple Sinai in El Paso, one of the benchmarks of modern synagogue design. The popularity of architects as diverse as Frank Gehry and Santiago Calatrava make much of Eisenshtat’s best work surprisingly fresh and relevant again. And remember, Eisenshtat's buildings predate computer generated design! Los Angeles, CA. Sinai Temple. Sidney Eisenshtat, arch., 1960. Photo: Samuel D. Gruber 2012. Eisenshtat was past president of Congregation Beth Jacob in Beverly Hills, which he attended daily. He and his wife Alice, were active participants in Jewish communal affairs. Though Orthodox, Eisenshtat designed several noteworthy Reform and Conservative synagogues (as in El Paso), as well as Southfield's (Detroit) Orthodox B’nai David. I'm looking at Eisenshtat's architecture again because I'm working on an essay about the iconography of the tent in synagogue decoration and design. Eisenshtat's mastery of thin shell concrete construction allowed him to use the tent-form in El Paso, where the synagogue sits at the foot of its own "Mt. Sinai." Certainly El Paso, Texas, was and is a far outpost in Jewish wanderings, what I have called in the past the "continuing exodus." Eisenshtat established an international reputation based on the expressive design of several synagogues built between the 1950s and 1970s. 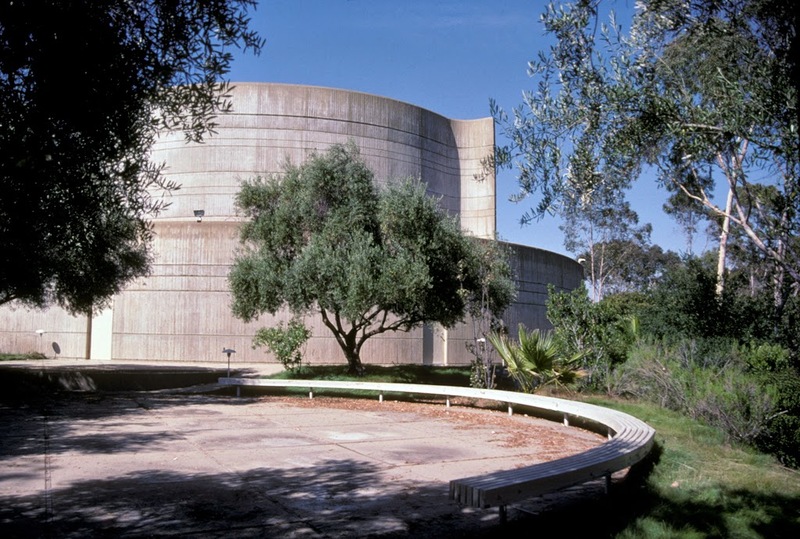 He designed his first major religious structure, Temple Emanuel in Beverly Hills, in 1951, in the first flush of a national reinvention of traditional synagogue design. 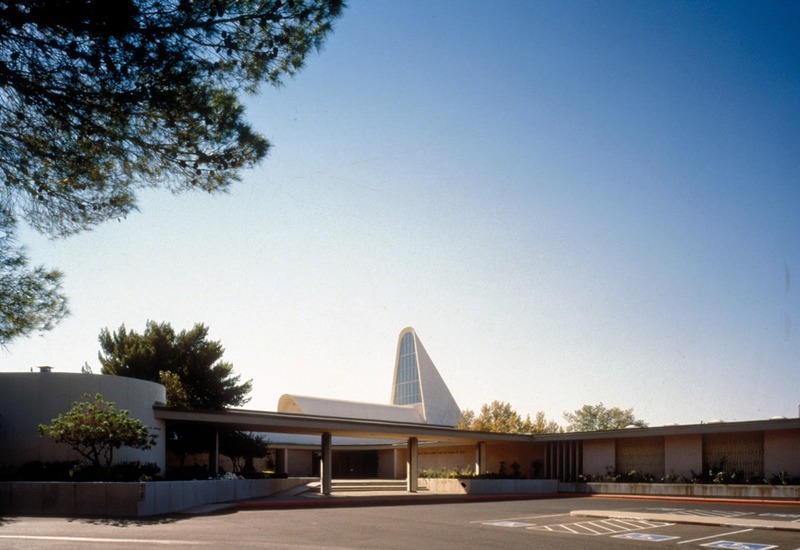 Eight years later, he designed Sinai Temple in Los Angeles. 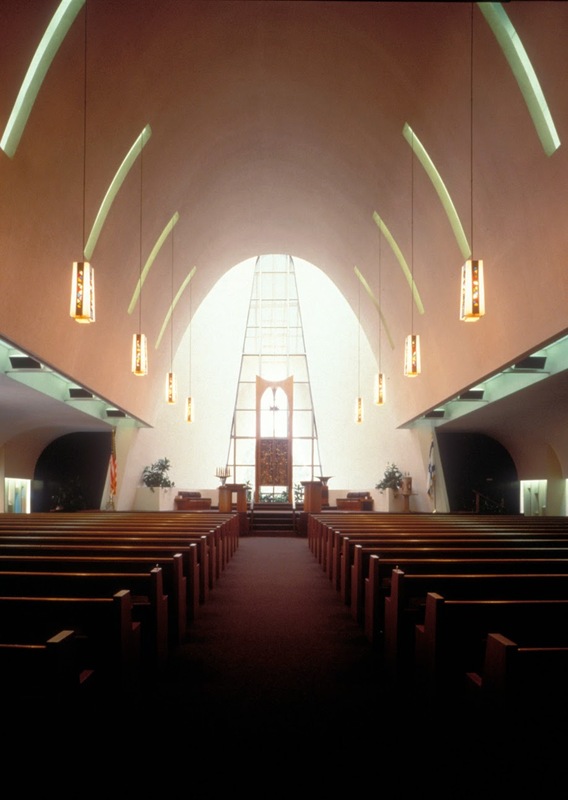 In the early 1960s he designed the Reform Temple Mount Sinai in El Paso, Texas, where he was commissioned to create a space that was both functional and expressive. He achieved this by integrating simple dramatic forms into a harsh but beautiful desert landscape. 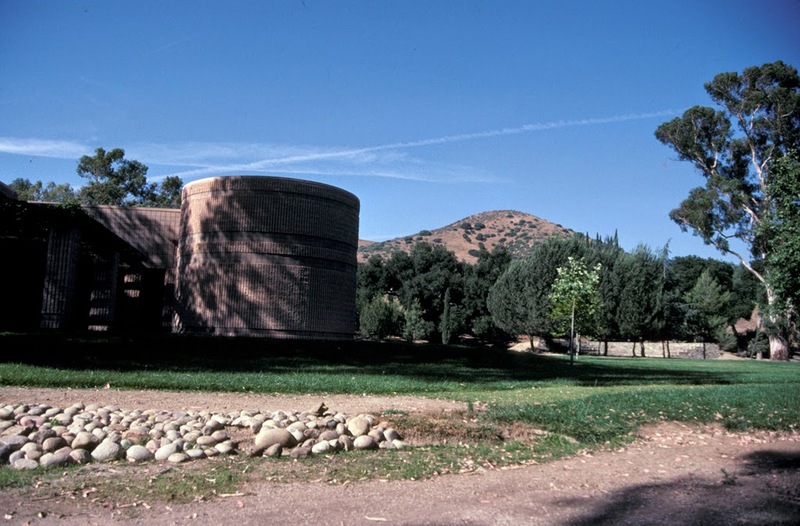 The El Paso synagogue and later the House of the Book, a chapel and conference hall at the Brandeis-Bardin Institute, located in Simi Valley, were integrated into striking arid landscapes, in which they are set like large sculptural works. Influenced by the work of Eric Mendelsohn, Eisenshtat became an expert in the use of the thin shell concrete for shaping space into expressive, often soaring forms. Like Mendelsohn, he created synagogues with white walls almost devoid of decoration, but that were highly expressive through the use of simple materials and abundant natural light. 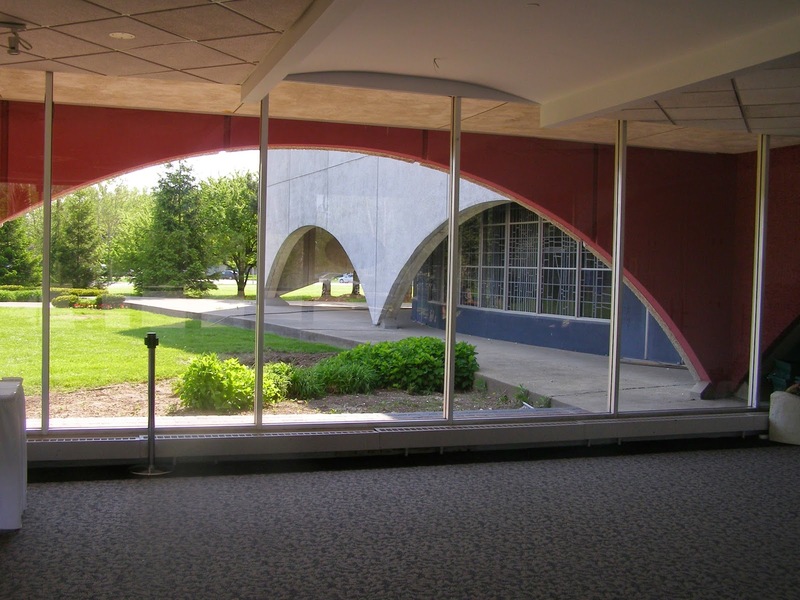 He did lavish some attention on the synagogue’s focal points — especially the Ark and windows. 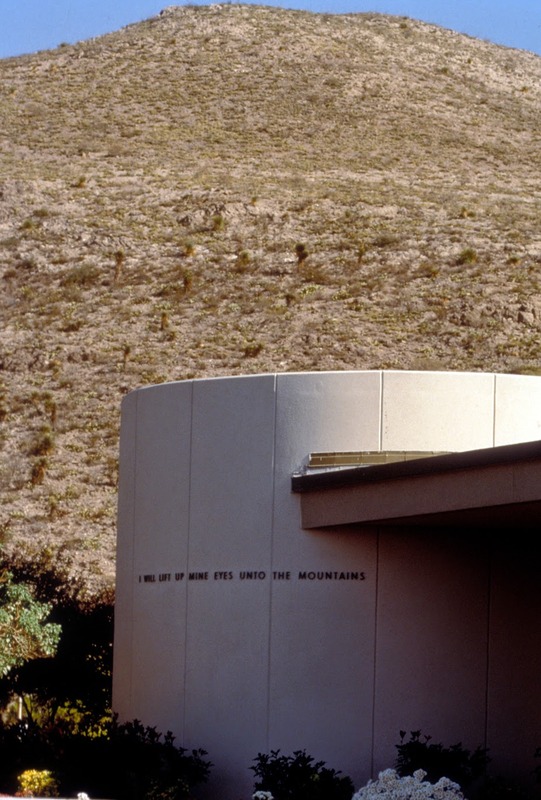 In El Paso, he designed the Ark as a giant open-frame tripod, set within the lofty concrete-shell tent-like sanctuary. Inside is an abstract bronze cabinet for the Torah scrolls; a bronze Eternal Light hangs above it. In other synagogues he included stained glass, mosaic, and sculpture, but these were always subservient to the overall architectural design. He favored large, airy rooms, though he could create moody interiors by carefully channeling light for dramatic effect. He has been described as an expressionist and as a minimalist. In addition to synagogues, Eisenshtat designed several centers for the study of Jewish life, including the Hillel House at his alma mater, University of Southern California. 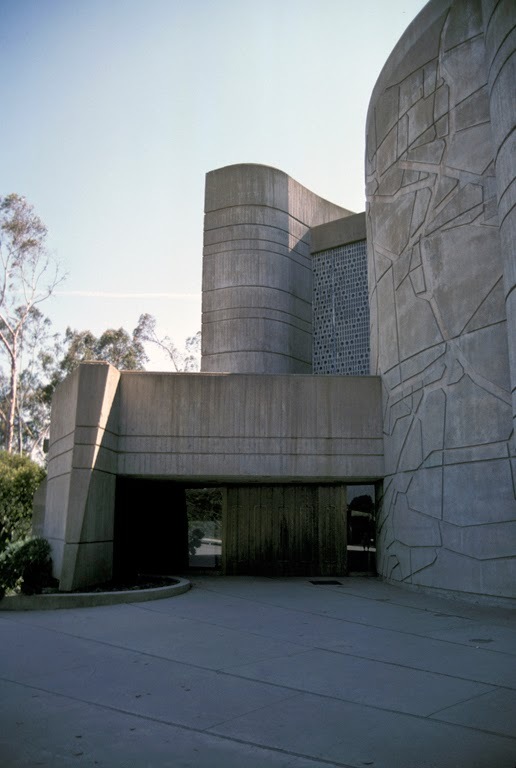 He also designed the master plan for the University of Judaism in Bel-Air (1977). Perhaps in a nod to the more secular world of Hollywood Jews, Eisenshtat designed the Friars Club in Beverly Hills (1961, demolished), frequented by many of the great Jewish comedians of the era.